**Bike sharing is not permitted. One bike per rental. **We have 50cc to 450 available. We do not have two-strokes for rent. 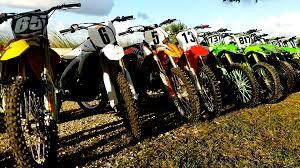 We mainly have Kawasaki and Honda dirt bikes. **Dirt bike rentals are on a first-come, first-serve basis. Please arrive early when park opens to guarantee your spot.